More decorating on the cheap! We bought a new 50' x 14' mobile home and put it on our property near Mountain Home, Arkansas. 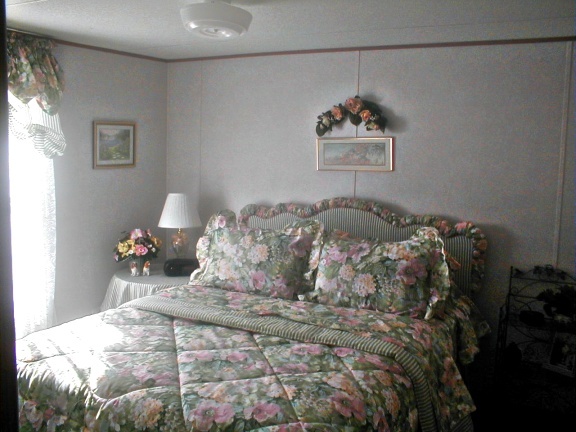 The bedrooms are small, but I think they came out pretty nicely, although my husband's fishing buddies say they are too "sissy". I guess they thought I was going to let them turn it into a fishing camp that looks like their hunting camp.....NOT!!! This is the master bedroom in our vacation home. I took an old cheap headboard and upholstered it the same way I did the headboard in our guestroom at our main home. 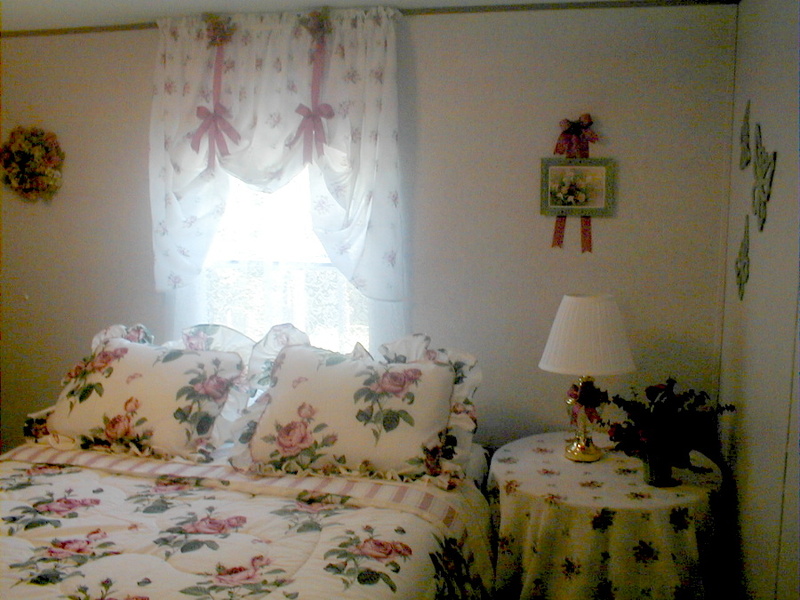 The double valance is made from coordinating sheets, with lace curtains beneath. The bedside table is made from a circle of plywood placed atop a 30-gal plastic trash can, which doubles as extra storage space...a necessity in a mobile home! The tablecloth is also made of sheets. I found the bedding at Target. 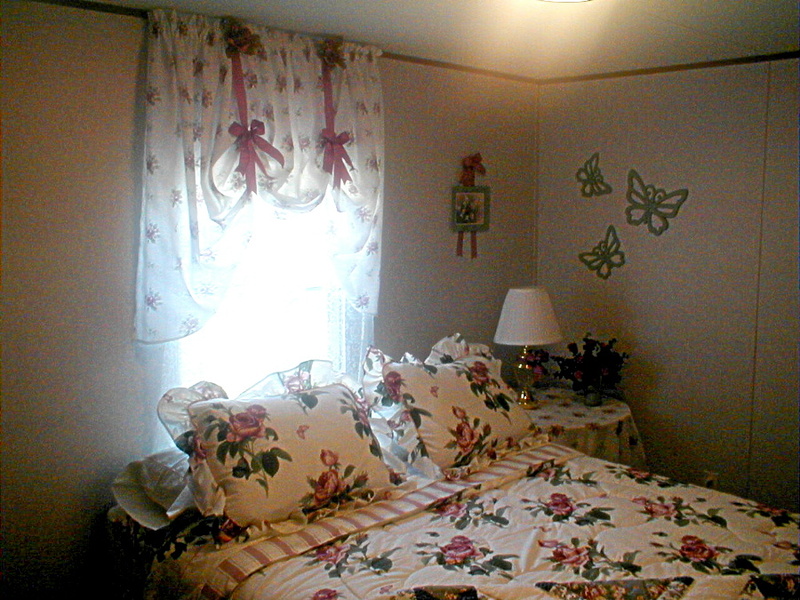 This is the guestroom at our vacation home. O.K., I admit that it's rather feminine, but it is my home too! 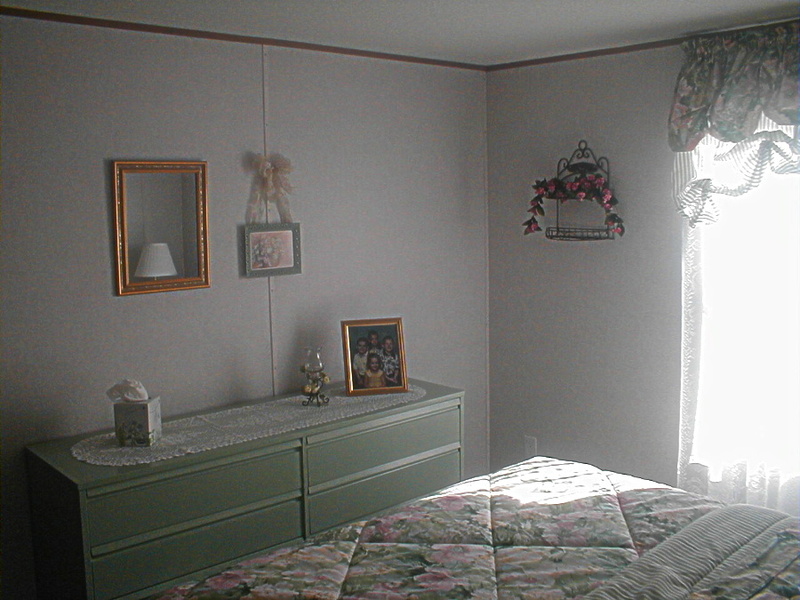 I was initially going to make a picket fence headboard, but when it turned out that I would have to put the bed under the window in order to have room for a bedside table, I decided to just let the window curtains be the backdrop for the bed. My sister-in-law gave us the dresser, and I painted it green to coordinate with the bedding. I found the mirror and prints at dollar stores. We have since had to put a small freezer in the corner beside the dresser...no other place to put it! I also added a collection of candles to the left side of the dresser. Candles really create a romantic atmosphere! The bedside table is also a plywood circle on top of a plastic trash can, and we store the grandkids' life jackets and flotation toys in it. The curtains and tablecloth are made of sheets that I found at Dollar General. The material is way too thin for sheets, but they made lovely curtains. I was very pleased with how well they coordinated with the bedding that I found at Target.